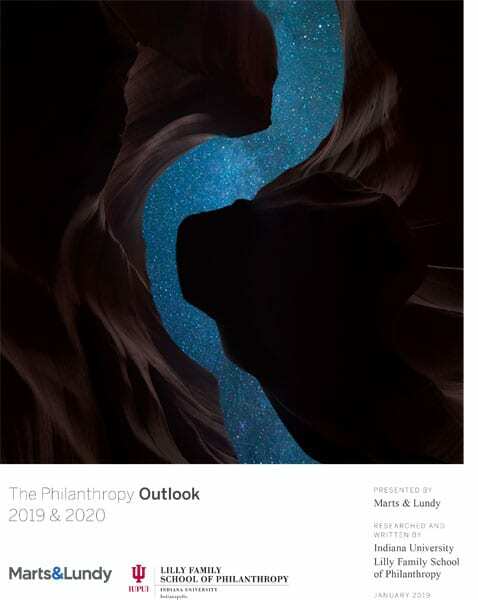 Yesterday, the IUPUI Lilly School of Philanthropy and Marts & Lundy released a charitable giving prediction for the next two years in The Philanthropy Outlook. It projects a continuing high rate of overall growth despite last year’s broad predictions about the chilling effect of the changes in tax law. Total charitable giving is predicted to grow (3.4% in 2019 and 4.1% in 2020), rising above the historical 10-year, 25-year, and 40-year annualized average rates of growth. Giving by individuals is predicted to grow (2.1% in 2019 and 3.4% in 2020), but will trail the rate of growth for total giving. Giving by foundations (7.0% in 2019 and 6.1% in 2020) and giving by estates (5.4% in 2019 and 5.6% in 2020) are expected to experience strong growth, outpacing growth rates for total giving in 2019 and 2020. Giving by corporations is also projected to grow (3.2% in 2019 and by 2.6% in 2020), but will lag behind rates of growth for total giving. Strong growth rates are projected for giving to education (3.5% in 2019 and 5.7% in 2020) and giving to health (5.2% in 2019 and 4.4% in 2020). These types of nonprofits have traditionally been associated with high-net-worth giving. Giving to public-society benefit nonprofits (1.3% in 2019 and 4.0% in 2020) will see slower growth than the other two recipient subsectors studied. Under the Uneven Growth Scenario, estimates for total charitable giving would make much of the regressive effect of the 2017 tax law less apparent. Since high-net-worth individuals/households are already responsible for a large portion of overall giving, enough economic growth—even if concentrated almost entirely among the wealthy—would result in increased giving. The picture for corporate philanthropy is less clear: strong economic growth may not do enough to offset the decrease in tax incentives for corporate giving, particularly if overall consumer sentiment is weak. Foundation giving would be strong due to the performance of the Standard & Poor’s 500 and GDP. Should the Flat Growth Scenario occur, total giving could stagnate or possibly decline because growth in the market and the economy would flatten by 2020. Individuals/ households—still unclear about how to maximize the benefits of giving under the 2017 tax law—may put off making charitable contributions until they are more certain, dampening giving growth. Due to S&P 500 and GDP growth realized in previous years, foundation giving would not immediately decline. Corporate giving may increase slightly, although this would largely depend on companies’ reactions to the new corporate tax rates. In the Economic Downturn Scenario, while current economic expansion is expected to continue into 2019, some forecasters expect the positive effects of the 2017 individual and corporate tax cuts to decline rapidly after the first two years, leading to recessionary conditions by the end of 2020. This scenario would result in reductions in charitable giving essentially across the board. Consistency and commitment, thy name is woman—women donors, that is.